Congratulations to the five new PADI Open Water Scuba Instructors !!! Later that day we headed back to the Kata Beach Resort, where the candidates delivered their Knowledge Development presentations. 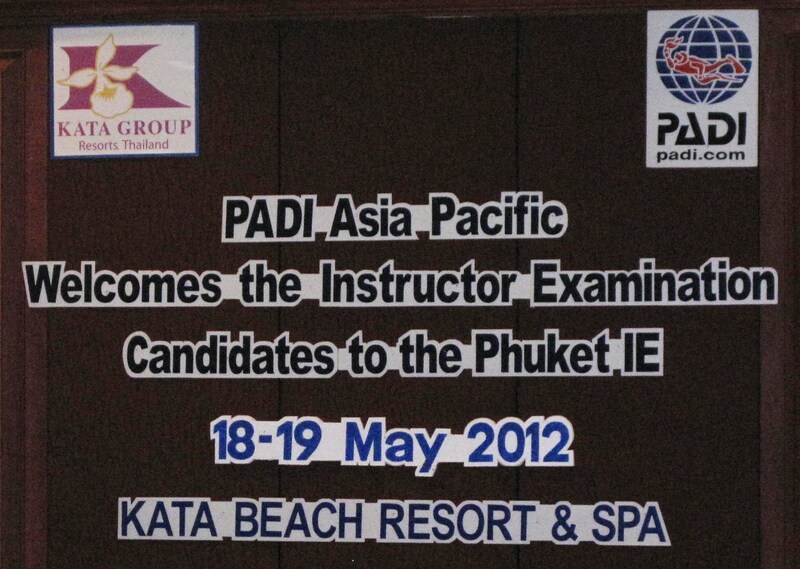 Again they impressed the PADI Examiner and came away smiling with very high scores ! That brought the day to an end, and it was once more time to retire to their hotel and make their preparations for their Open Water presentations at Paradise Beach the following morning. The Open Water section of the IE also ran very smoothly. The candidates all recorded very strong scores yet again, and they all performed excellent demonstration quality rescues too. This was the final section of the examination process, and once this was completed it was time to relax and smile and contemplate life as a PADI Instructor !!! Making that first step towards becoming a PADI professional, and then continuing on to become an instructor changed my life. Now my job is to train PADI Divemasters and Instructors, helping other people change their lives. Whether you are 18 and deciding what you would like to do with your life, or are bored with spending your days confined in an office and are looking for a new challenge, or you would simply like an exciting gap year adventure, becoming a professional in the scuba diving industry will open up a whole new world to you. Water covers more than 70% of the globe, making Earth the ‘Blue Planet’. Yet this part of our world beneath the surface of our oceans, seas and lakes is one that few people experience and get to know. As scuba divers we are able to immerse ourselves in a world teeming with life, a world that almost seems to be a different planet from the one we experience here on land, a world where we are the ones stared at with curiosity. Away from the stresses and distractions of everyday life, you are able to clear your mind of stress and tension, and intimately experience the vast amount of plant and animal life. Scuba diving broadens your horizons, and changes your life. As a dive pro, you have the opportunity to explore a whole new dimension. It gives you the chance to explore and travel. Becoming a dive professional allows you to experience the amazing and diverse world that exists underwater, and get paid for doing so !! With this lifestyle also comes amazing opportunities to travel. Since completing my Divemaster & IDC courses ten years ago, I have had the privilege of living and working in various countries, experiencing many different cultures along the way. Before arriving on Koh Phi Phi on the west of Thailand, I had already lived and worked in New Zealand, Australia, Philippines, Cambodia, Egypt, Indonesia, Palau and other parts of Thailand. It does not matter whether you are already an experienced diver, or you have never dived before, Phi Phi Barakuda have the best programmes for you to achieve your PADI Divemaster or PADI Instructor certification, so that you can dive into life and become a scuba diving professional.